Our Pre-K class made a very basic craft, but WOW does it brighten up an area. I don't have any patterns here, I took the picture when I stopped in, but forgot to bring materials home to show the steps. 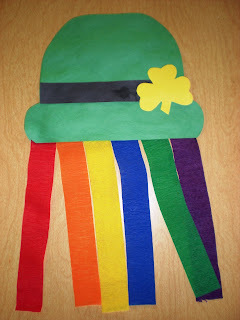 Draw a leprechaun hat shape on green paper. Have the children cut it out. Add the black strip and yellow shamrock for detail. Finally glue some streamers to the bottom of the hat. This is one easy way to liven up any area for St. Patrick's Day. That is so cute. I am going to try this with my toddler and older son. It looks great to hang as a decoration too. I can't wait to give it a try! My kid love your site and I have saved it for them to visit again. I would like to share with other readers my site on software to teach elementary maths. Have a look. Thanks for the friendship, Trish! I love this and will be making it with my little ones tomorrow :)! I'm going to go buy some streamers today. Very cute! I link over to you from my Leprechaun post. These are cute, we made similar ones and hung them from our ceiling. They do brighten up the place a lot.